*Note: If you can't find cardamom seeds, use 1/2 teaspoon cardamom powder. Combine the powdered milk, oil, baking powder and egg. Mix it throughly until it forms a dough. Make small "malai" balls out of it and flatten them a bit. Next, boil the milk with the cardamom seeds (or cardamom powder, if using) and sugar (the amount of sugar is up to your taste, you can add more or even less than the amount given). Start adding the malai balls one by one. When the balls start rising a bit, reduce the heat and let them cook for about 10-12 minutes. Remove from heat and place in serving dish. 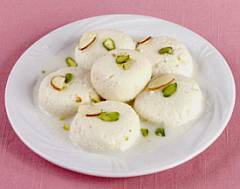 Serve "Ras Malai" chilled, and if desired garnish with sliced pistaschios or sliced almonds or a combination of both. excellent recipe. makes a really light and tasty version of the classic pakistani dessert. great year round espcially summer because not too creamy and heavy. can make the malai balls a bit more dense by mixing 2/3 nonfat milk powder and 1/3 nido full cream milk powder. Delicious, great taste. Helped me a lot. My family and friends enjoyed it. A recipe to keep. Very easy to follow. Have made a couple of times and the results are always great. Excellent recipe. Today I tried your recipe of Ras Malai, its really really very good and easy, Thanks again. it tastes really really really good! i really love this stuff and you make it real easy to make, thanks. oh well, all those so very difficult recipes of Ras Malai where we have to add cottage cheese and drain it and god knows what, it's much much easier to use powdered milk. amazing recipe, i just made one mistake earlier, i added too much baking powder. best ras malai recipe of all i have tried, taste as well as ease of preparation. Article needs a correction- Rasmalai is not a Pakistani dish- its from Bengal! Though admittedly popular in Pakistan. Brilliant, your mum deserves an award! I love Rasmalai so I decided to make it at home. I've tried to follow the recipe twice but have been unsucessful. The Rasmalai balls become too soft and break when I have added them into the milk. Don't know what i am doing wrong!!! Can this Ras Malai be made without eggs? Recipe is very easy but I don't want eggs in it. Can something else be replaced? Thank you. They're delicious but mine certainly don't look like the picture. Any ideas? Really easy to make Rasmalai, but to be careful while adding baking powder (1/4 teaspoon). Perfect Rasmalai. Thank you so much. Lovely recipe, came out real good, thanx! Fantastic! This recipe brings old friends together with a common memory. Reminds me of my days before I came to America. Such a beautiful scent too. Just like mom used to make!